Artemis Technologies was established in 2017, as a sister company to Artemis Racing which has over a decade of experience in high-performance yacht racing and America’s Cup competition. 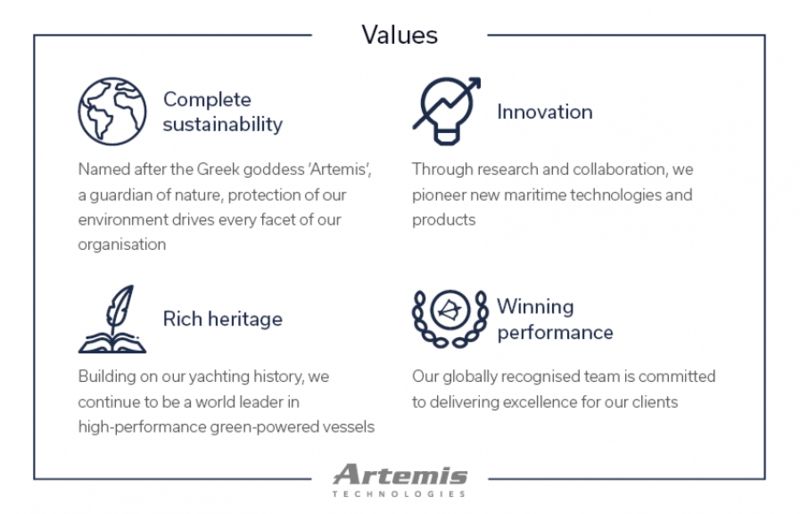 Led by double Olympic gold medalist yachtsman Iain Percy OBE, and with a team of global experts from the fields of aerospace, motorsport and yacht design, Artemis Technologies has already established itself as the world’s leading high-performance maritime design and applied technologies company. Utilising world class skills in simulation, lightweight structure engineering, electronics, hydraulics, aerodynamics and hydrodynamics, Artemis Technologies has been developing new green technologies with various maritime applications for the past year and aims to deliver real innovation to its customers through unique solutions and products such as fast racing boats and autonomous sailing vessels. To lead in the decarbonisation of maritime through innovative, sustainable technologies and products. Through research and collaboration, whilst utilising our America’s Cup heritage and global expertise, we aim to manufacture the world’s first hydro-foiling and self-regenerating powered commercial vessels.